Question: What new smartphone feature would you not be able to live without? Tim Cook just made a bold promise by saying that the next generation iPhone would have "things you can't live without" and that you "don't even know you need today." That's a big promise and it made us wonder what such features might be. Of course, making a poll for this doesn't quite work because the answers for iPhone users would likely be very different from Android users. For an iPhone user, features like fast charging, an always-on/ambient display, front-facing stereo speakers, or being waterproof might be "new" features that would be fitting answers to the question, but are common on various Android devices. For Android users, the idea of a "new" feature gets difficult because there are so many options out there and all of those options and more can be found in one device or another. 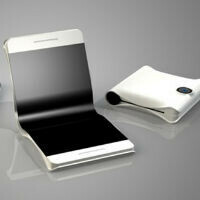 A foldable smartphones would fit the bill, but the best estimates say we're still at least a year away from that. The one feature we've heard rumored that doesn't exist on either platform would be wireless charging from a distance, and that could well be made available this year. And, it's possible that the features Cook is talking about are software-based, not hardware, so that could include massive updates to voice control or adding more augmented reality features. So, what's a new feature that is realistic to come in a new device this year that would fit your definition of something you wouldn't be able to live without once you have it? Longer battery life and 10 second charging... Although, this is just Apple's way of saying they're gonna throw in gimmicks and force users into using them in some aggressive way as usual, that users will never be able to go back. iBlast is not a gimmick. Its obvious. Most of attention in smartphone industry over last years has been about camera. So, dedicated camera button is finally coming to iphone, than, in a matter of months... to s8 and maybe already to n5, too. The S8 wont need it, because the volume rocker is a camera button. No it isn't. It already had buttons you can dedicate to the camera. I remember when an app on Cydia allowed you to use the power button or volume controls for the camera and then Apple purpose patched it to prevent it until they felt like giving it too you. To me, it just looks like Apple has ran out of other peoples ideas to steal. The OEM's should stop disclosing what features that will have and put gag orders on their suppliers so Apple doesn't know whats in the pipeline. - Cross platform Bluetooth and WiFi Direct. - No need of iTunes when conectig to PCs. - Option to speed up animations. - USB OTG. They won't because of some insane sheep mentality to stay loyal to the death. IOS had USB OTG or similar. There are adapters that can use sdcards with the lightning port. Right? I know theer were with the original connector. Removable battery, MicroSD, durable construction. The LG G5 is the only choice this year. Umm a 3x battery life increase. If the iPhone 7 plus has 3x the battery life of the 6s plus then yeah i'll get it and say I can't live without it. Oh, I posted on the wrong article, it supposed to go on the apple article. From distance wireless charger! This could keep my phone always charging while I work, drive, browse, call, work out.. and so on. After few months or years, we can't imagine our life without it! Again you need to know what you're talking about. I showed this to you before. https://www.qualcomm.com/products/wipower This company call WiPower which Qualcomm bought, patented a concept for wireless charging over the air. Any phone bearing the SnapDragon 8xx can use it. The S5 and Note 3 supported it, you simply had to buy a different back cover which Samsung did offer on their website for quite some time. The same year Qualcomm bought WiPower who made this tach back in early 2000, Apple decided to patent their own. Hwoever the concept is likely to be invalidated due to prior invention which was made by Nikola Tesla. When someone tries to show you factual information, why not actually take heed to it. Its not just wireless...ITS TOUCHLESS!!!!!!!!!!!!! As I stated, ALL PHONES BEARING THE SNAPDRAGON 800 or higher can support this. All the S6's and the Note 5 and S7 already support this charging method out the box. You do not have to lay them on a pad. They simply need to be in ranage. I think the tech that Apple is patenting, has simply increased the range of the charging capability. It works like wifi basically. The closer you are the better. However, this WiPower option has the range of I believe up to 3 feet. Stop posting this, it's not finalized, it doesn't work yet, and it still requires very very close proximity. --- I would like my phone to s tart chargin as soon as I enter the house - just like wifi, lay in bed, watching tv. It's better than pad charging that they call wireless, but it still seems limited. Let's see it when the hype settles. I see cancer everywhere with full wireless charging. Current wireless charger isn't true wireless charger.. its Contact Charger as you need to have you're phone physically touching the pad the same way a charger cable has to physically touch the charging port. Wireless chargers don't NEED to be in contact. That's why you can use it with a case. It's just a lot more convenient to put the phone down than to stand there holding it a few millimeters over the charger. "the same way a charger cable has to physically touch the charging port" Wrong, just wrong. And tell me.. what is you're phone touching or "contacting" when in a case.. Your right... your phone physical cable charger doesn't need to physically touch the charging port, silly me.